Sewn With Grace: How Much Is Enough? Thank you for your kind words on the t-shirt quilts. Tricia, from Notes of Sincerity (one of my favorite blogs) asked me what pattern I use and I wanted to share the one above. I have a couple, including this one, and it's an excellent source for just $10.53 on Amazon. Today I am asking you, how much is enough? One of my favorite sources for fabric (besides Shabby Fabrics) is the Fat Quarter Shop. I couldn't stand it any longer and purchased the bundle above. It's called "Hankie Club" and yes, the fabric looks like vintage handkerchiefs. Can you believe it? 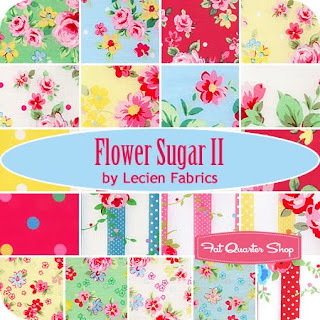 I'm hoping you can suggest a pattern for me as I want to showcase the fabric and make it vintagey too. This one is just about as close to fabric euphoria as it gets for me. It's not out until June. I haven't even cut into Flower Sugar I yet. 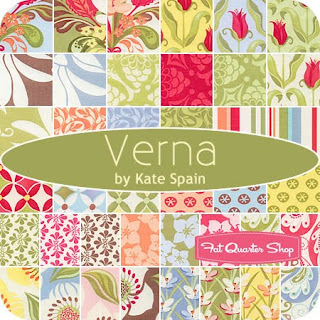 Verna has been on my wish list for a while now, but I do have to purchase food to feed the family so I'll have to wait. It's not like I don't have any fabric, honestly. What happens to us when we see fabric? It's a feeling, for a crafter, that is unexplainable. 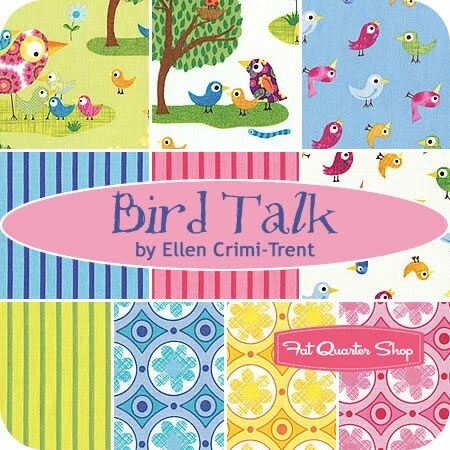 Bird Talk is off limits to me too, but wouldn't it make a great summer quilt? Stop by the Fat Quarter Shop and check out all the goodies. Again I ask you, how much is enough? You are most likely asking the wrong people! :) There is just never enough beautiful prints to have & to hold. I'll have to check out the hankie fabric. My favorite section to browse is the 'coming soon' section! 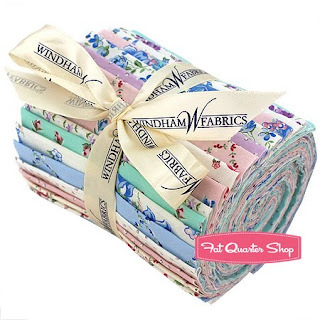 I know, just when you think you have all the fabric you need and they can't make anything prettier, they do! And I have to have it. I do love fatquartershop! I am addicted to fabric haha! Ok I've never made a quilt before but I love your blog so much (your's and I Love Pretty Little Things are my favorites!!) 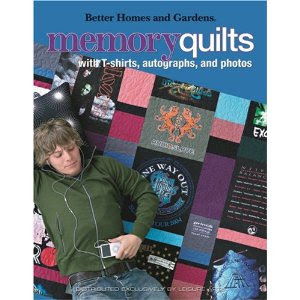 and I love looking at your quilts... and lately I find myself wanting to make one. So this might be a dumb question haha but can I make a quilt with a sewing machine? I should look into making one because I would love to make something special for my daughters! :) I'm going to get in trouble on fatquartershop.com haha! All these lines of fabic look wonderful. Oh, Renee, I WISH that we Could say "Enough"
There is just too much of a weakness, or possibly addiction to truly say "Enough", and mean it! Oh so much beauty!! It calls to you doesn't it? I am on the waiting list for the Flower Sugar 2's arrival. I will pinch pennies for that beautiful fabric! Oh my, I do love the beautiful florals. Yesterday I dropped my son at the local college for a tour, and of course I had time on my hands. Two quilt shops within range, so I did pay them a visit. And helped the economy too :-) Please stop by my blog and vote for my friend. Have a great weekend! Beautiful collection of fabric! There is something so soothing about going to the fabric store, feeling each bolt, and dreaming about all the possiblities that await! I guess "enough" is when you just aren't sewing anything from fabric you have purchased!!!??? I have quite a large stash of fabric. My mom and mom-in-law have given me stuff from their collection. I actually try to use what I have before venturing out to buy new supplies. I try to be resourceful...:) Sometimes it is hard to resist buying new beautiful fabric though! I don't think you can EVER have enough ;) I love your collection of fabrics! As a quilter, I can never have enough. I always want what's new. Back when I started quilting, you really had to hoard what little good quilting fabric and patterns you could find. Now I can't seem to break that train of thought. I will never be able to use all I have, but that doesn't keep me from trying. And...thanks for the new temptations. Love all those you pictured and don't have a one of them...yet.